The new beginner's course has already started but join us just any time! Karate is a martial art that can be exercised at any age with its different facets and aspects of all people. The youngest karate (Karateübenden) at our club are 8 years old, the age range to 64. It's never too late to start with this martial art, because karate is not only an ideal workout and balance with everyday life, but also helps step by step the condition and performance. For some, the karate training is a particularly effective type of sport that is both endurance, coordination and agility ideal trains, for others outweighs the issue of self-defense, the competition or intellectual development. 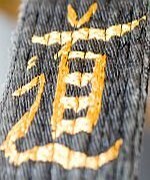 All these aspects have their place and their place in training and demonstrated once again the diversity of "Karatedo". Our karate club held once a year, a beginner course for adults. Classes start after the summer holidays - but you can join at anytime. Career changers are always welcome. The beginner`s course is scheduled in a fixed group for one year. During this time, the participants initially practice once a week and are introduced in the basic techniques of karate. The aim of the course is to give the new students a solid technical foundation to join the intermediate group afterwards easily. Children from 8 years onwards may join the existing children's groups right from the start.